Posh striker Matt Godden wheels away after scoring his second goal at Southend. Photo: Joe Dent/theposh.com. The bookmakers have taken note of Peterborough United’s outstanding start to the season. Sky Bet make Posh 11/2 third favourites to win League One behind Sunderland and Barnsley. At the start of the season Posh were 16/1 to finish top. 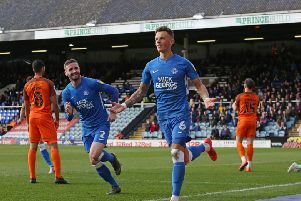 Posh have won all four of their away games in League One this season scoring 13 goals. They have scored 19 goals in total, four more than any other team in the division ahead of a clash with second-placed Portsmouth at the ABAX Stadium on Saturday (September 15). Strikers Matt Godden and Jason Cummings are the joint top League One goalscorers with six goals alongside Barnsley striker Kieffer Moore. Godden has seven goals in total. “I look at the size of the clubs, the size of their support and the strength of their squads, and I agree that Sunderland, Barnsley and Portsmouth are the favourites for promotion. Sky Bet League One title odds: 7/4 Sunderland, 11/4 Barnsley, 11/2 Posh, 7/1 Portsmouth, 22/1 Fleetwood, Luton. League One top scorers: 6 Godden, Cummings, Kieffer Moore (Barnsley), 5 Ronan Curtis (Portsmouth), Ched Evans (Fleetwood), Josh Maja (Sunderland).